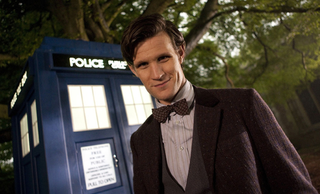 Matt Smith's had quite a transformation for Ryan Gosling's new movie! Bloomin' eck. Set pictures from How to Catch a Monster have revealed a... radical new look for the 11th Doctor. Told you so. The hair! All that wonderful hair of The Doctor's has been mercilessly lopped off in favour of a (dare we say Ninth Doctor-esque?) buzzcut - one so close that you can see a massive scar from a childhood head injury. The pictures, from Buzzfeed, could cast some intriguing doubts about The actor's return to Doctor Who later this year - filming of the Christmas special, and possibly Series 8, is due to begin around August/September time. Could he possibly grow the 11th Doctor's luscious locks back in time? Or perhaps this is a sign of River's fabled 'New haircut and a suit' line from Forest of the Dead? Either way, let's all take a moment to mourn the loss of a pretty fantastic head of hair.